Maxine Husbands with one of the boys in the infants school. Thirty-eight years in one profession is pretty much a lifetime. But Maxine Husbands takes it in stride, with an ever present smile. 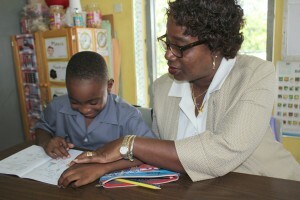 She entered the teaching service at 16 years old, when after a short training stint, she was assigned to Deacons Primary, then the Christ Church Boys’ School, now called Milton Lynch Primary, before ending up at Selah Primary in St. Lucy. Back when Husbands was leaving school, she said there were only about four main professions women were expected to opt for – nursing, banking, secretarial work or teaching. However unintentional a choice, she chose the latter. And it was not a big deal, she said, that she was only 16, when even then most young teachers would have been about 18. Back then, most girls would have been thinking about how to help their mothers support the family or do their part to help raise their siblings. So this was just part of the process into adulthood for young girls. “I left Deacons and went to Milton Lynch for five years and then here. It didn’t seem exceptional to start at 16 for me. Since then I’ve realised that I was quite young because most people would have started at 18. I think in my case I would have started secondary school quite young because then you could sit the exam at 10. So I passed at 10, went to secondary school and by 14 or 15 I would have done O’Levels and that second year when I went back to school, I was going into Upper Fifth at 16. Gesticulating from behind her desk, even as the voices of young children floated on the air with lessons going on in nearby classrooms, Husbands reminisced that times had changed much from her early days. Teaching itself, she noted, was a lot more technologically based now than before, when teachers would have had to prepare lesson and teaching aides by hand, often pulling their own pockets for materials. Additionally, the typewriter and duplicator were the main form of “technology” they had at their fingertips. It’s calm and peaceful up here, said the principal. Where before the teacher always seemed to have the full backing of the parents, now things were quickly changing to the point where parents are quick to cry down the teachers rather than help them help their children. It also meant approaches to teaching were rapidly changing to keep up with changing classrooms and environments. “Parents weren’t so quick to criticise what you were doing. Nowadays parents pay more attention, which isn’t a bad thing in itself, because it keeps you on your toes, but the children themselves are more difficult to handle because there are so many distractions. You have to work a lot harder to get them focused in the first place. The key, she emphasised, was to keep demonstrating and reiterating the importance of education to children at this young stage. Her motto, she said was ‘You are here to learn’. With the changes in education, Husbands said, came changes in the psychological approaches needed as well. “You have to employ more psychological tactics than before. It means teachers have to know a lot more about how children learn, especially how modern day children learn, which may be different from how they were before. For Husbands, just like teaching was something she did and found she liked, administration came just as much by chance as did her first posting. A position opened for senior teacher and she was told she should apply. Similarly, when a position for acting principal opened at Milton Lynch, she was asked if she would be interested and thus went the story. “There isn’t much that I don’t like [about teaching]. You will always find difficulties in whatever you do, but when I come across a problem I just find a way to solve it. I like to see children doing well and I believe all children have the potential to do well in something. So I pride myself on being able to discover what potential a child has. So I like to see children reach whatever potential they have,” she said. Reaching potential is something she knows about not just in education, but as the wife of politician, Senator Harry Husbands, she noted that she enjoyed working behind the scenes, watching plans come to fruition. And while she has no political aspirations of her own and continues to support her husband as much as he continues to support her growth and development in education, Husbands said that education could perhaps be where it is for her until retirement. She looks forward to the challenge associated with a new project and will not refuse if any are thrown her way either at the school or ministry level, because she absolutely loves learning new things, but for now she loves driving into the gates of Selah Primary, listening as the children call out “Mrs. Husbands” or walking into a classroom to associate with both staff and students.